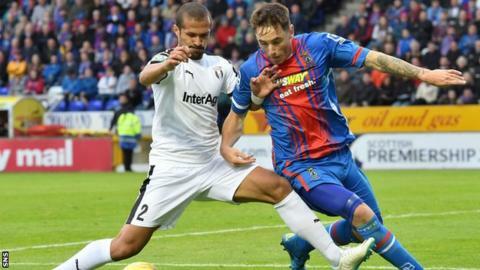 John Hughes believes Inverness Caledonian Thistle are still "well in the tie" despite losing 1-0 to Astra Giurgiu in the Europa League qualifier. Constantin Budescu's first-half free-kick gave the Romanians an away goal and put them on course for the third qualifying round. "They might be more nervous playing in front of their home supporters," said Hughes. "We just need to be a little bit more cutting in the final third." Budescu beat debutant goalkeeper Owain Fon Williams midway through the first half with the hosts having earlier threatened through Ryan Christie. Aaron Doran, Greg Tansey and Danny Williams tried to force an equaliser on what proved to be a frustrating night for the hosts on their European debut. "We certainly deserved something out of the match and we're a little bit disappointed to concede a goal, especially the way we conceded it," Hughes lamented. "We were well warned about Budescu's quality around the edge of the box from dead balls and we gave away, I felt, a cheap free-kick. "But in terms of effort and the way we want to play the game, we dominated. We were a playing against a good side, they got numbers behind the ball. "We peppered their goal a few times with shots. We're still well in the tie. I just spoke to the coach (Marius Sumudica) and he praised our style of football. "Very proud of the boys. The only disappointment is losing that goal. "No matter what, it's a great experience for us to be playing in Europe and over the piece, we acquitted ourselves very well." Hughes is still hopeful the Scottish Premiership side can progress against their more experienced European opponents. "I don't know how they'll play at home," he explained. "I don't know if they'll go and play a different tactic, if they'll come out and open up. "We don't want to go over there and the game's done and dusted in the first half. It's 90 minutes so we have to make sure we go over there and make sure the shape's right. "We might have to give up a little bit of possession and we might have to play a reverse role and hit them on the counter attack."